HiPoVacc - Platinum Cured Silicone Hose Reinforced with SS 316 Helical Wire | Dubai ,United Arab Emirates from Himsan Polymer Pvt. Ltd.
Our Inflatable Seals are made from High quality Silicone Rubber conforms to FDA 21 CFR 177.2600 for Food grade criteria suitable for Various sealing applications. 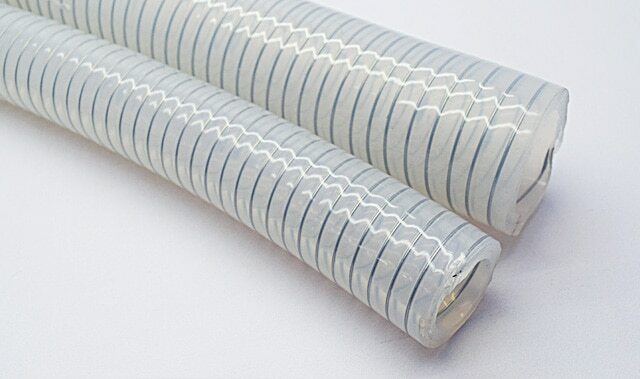 These inflatable seals starts inflation range from 5mm to 20mm when 2-4 kg/cm2 pressure is applied after installation in door. Himsan Polymer Pvt. Ltd. offers a wide range of Silicone Extruded Door Gaskets in more than 1000 different shapes and designs. (In round and square types). Himsan's Extruded Door Gaskets (Autoclavable) Gaskets are made from Food-Pharma grade Pure Silicone Rubber which can easily withstands a temperature range of -80°C to +250°C. Himsan's Extruded Gaskets are available in square cross sections like 6mm x 6 mm, 8mm x 8mm, 10mm x 10mm, 20mm x 20mm, 25mm x 25mm etc. with OR without hollow. These Gaskets are available in Red, White, Orange or any colour as per customer's requirement. We also undertake small and bulk order for these gaskets from 25 Mtrs to 25000 Mtrs. Himsan's Extruded gaskets are manufactured from fully automatic continuous curing system which ensures accurate dimensional properties, glossy surface finishes and aesthetically beautiful colours.